We worked with a respected content marketing agency to bring this timed, multilingual campaign site to life. 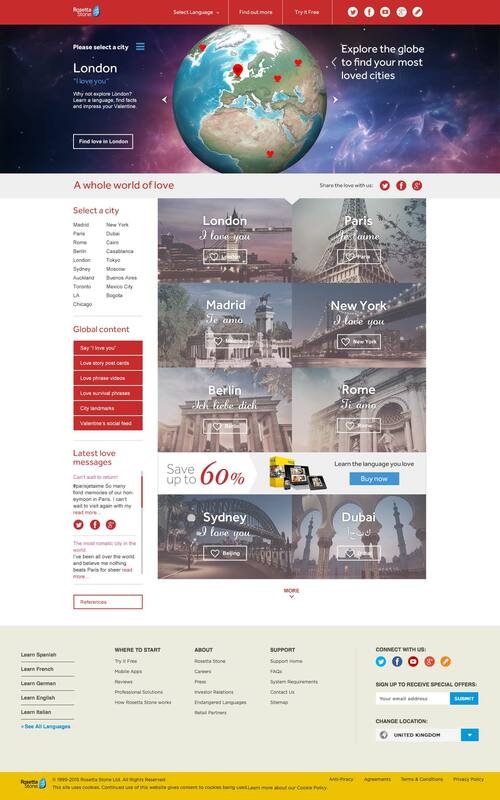 A global celebration of the world’s most romantic cities – the micro-site contributed to a massive 415% uplift in sales. Initially targeted at Valentine’s Day and later extended for other key gifting dates, the site worked hard to engage users and encourage social media interaction – successfully raising awareness of the Rosetta Stone brand among a younger target audience and driving sales. Content was presented in many different languages and the client had full control through a custom CMS (Content Management System). Effective SEO practices were employed at all stages of production to ensure a maximum return on investment. Extensive marketing tools were integrated so conversions could be tracked and measured. We also contributed to an effective supporting SEM campaign – creating targeted animated ads, published across many platforms.